Ribbon Ads - Eye-Popping Banner Ad Technology! if you don't know a single line of HTML code! This software is simply amazing. I am using it on several of my sites and have to say that the uniqueness of the diagonal banner makes it very, very powerful. Very easy to use, and congratulations on one of the truly unique offerings out there to enhance the "stickiness" of our websites. "Ribbon Ads" Enter Thru The Back Door And Instantly Grab Attention Before Your Prospects Even Know About It! This is exactly what "Ribbon Ads" do! Because they are new, they really catch peoples attention, your prospects almost feel like they HAVE to read what the ribbon says. Not only do they ensure your message will be seen, but they are far less intrusive, they create curiosity, and get massive click-thru-rates! 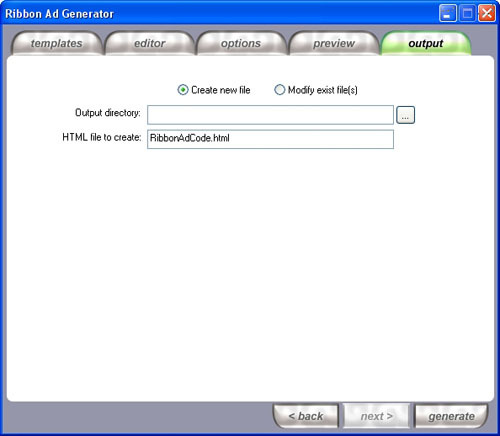 How Can I Use "Ribbon Ad Generator" To Make More Money? Your Products Main Benefit - Mention your products most important feature in a Ribbon so you know its getting the attention it needs! Prebuilt Ribbons For Your Affiliates - I used this method in my testing and got fantastic results. Make a Ribbon Banner yourself and give your affiliates the code to add it to their web pages. Their happy because they increase their commissions, and when they make more money, you do too. Contest Announcements - Let your visitors know about any contests or sweepstakes your currently running. Building Your Opt-in List - Mention whatever free gifts you give away to get more people to opt in to your list. Promoting Affiliate Programs - Make sure everyone knows about the latest affiliate program your promoting as soon as they visit your site. Limited Promotions & Discounts - Scarcity can drive your sales through the roof, make sure your prospects know about your limited offers! Product Updates - Telling your prospects that your product was recently updated will send your sales through the roof! Building Anticipation - Get people buzzing about an upcoming promotion of yours. Give them a little taster of what they can expect to see soon. As you can see, with 'Ribbon Ad Generator' you will know longer have to hope your visitors are seeing your message, you'll know they can see it and your results will prove it! 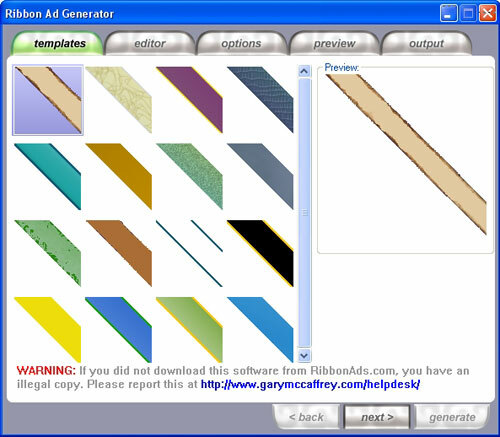 You Can Use "Ribbon Ad Generator"
The simple Windows™ application guides you step-by-step through the entire process of creating attention grabbing "Ribbon Ads". Choose from one of the 16 ribbons that are preloaded into the program, simply click on it and move on to step two. We've also made it so you can use your own custom designed ribbons, its super easy and you can add as many as you like. At this stage you can add whatever text you want to appear on your "Ribbon Ad". Resize it to fit your webpage, and generally edit its look and layout. You can use any font you have on your computer to give you complete design flexibility. The program adds the text to your ribbons in a different way to other banner design software, so you never loose any of the image quality at the end. Once you're finished editing how your ribbon looks, you now have to tell it what you want it to do. Add the text you want to appear when someone hovers their mouse over the ribbon, add the website you want your visitors to go when they click on it, and whether to open it in the same window or a new one. After you've previewed the look of your Ribbon Ad, now you have to add it to a webpage. And we've made this as simple and hands free as possible. All you have to do is browse to any webpage on your hard drive and select it, the program does everything for you. You can add the Ribbon to multiple web pages, even an entire directory of web pages at once. That's you done! Now you just upload everything to your website and watch as your new attractive Ribbon Ads increase your conversion rates time after time. I can't believe how easy this program is to use. 5 easy steps to follow and your ready to use your ribbon. Can you believe it took me only 5 minutes to make my first ribbon and post it to my website. The second ribbon only took half that time. Perfect product and perfect look for any websites. Thanks a lot for such a nice software program. You've probably seen these 'Ribbon Ads' being used by a few smart marketers for a while now. I have been using them and getting great results. Up until now you would have to hire an expensive designer to build them for you, and it would cost quite a bit for each banner... Now you can build as many as you like and it only takes a matter of minutes! You just will not find any other software or service that makes this kind of ad anywhere on the internet. Some other banner design services whose ads aren't even as powerful will charge you a monthly fee, and then limit the amount of ads you can create. 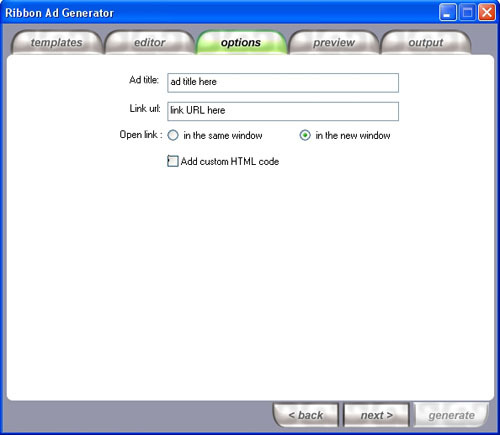 With 'Ribbon Ad Generator', the entire ad creation and hosting process is under your control, you can create as many as you like and host them on any site you like, forever. Order now! Your satisfaction is important, and I guarantee it when you order Ribbon Ad Generator and I back it with a no risk, no questions asked, 100% money back guarantee. And Watch Your Profits Shoot Through The Roof! You might be thinking that software that gives you such a competitive advantage would be out of your budget right now. Well, what if I said you could start putting the power of these attention grabbing, click sucking 'Ribbon Ads' to use instantly for under $100? Sound good? I could easily charge much more and this offer would still be a steal. But for a limited time, you can order your copy right now for only $17, with Master Resale Rights! When you see how much clicks these ads get you'll know what a great deal you're getting here. For the low price of just $17 you'll receive this powerful software that will start putting extra profits in your pockets almost immediately. Yes! 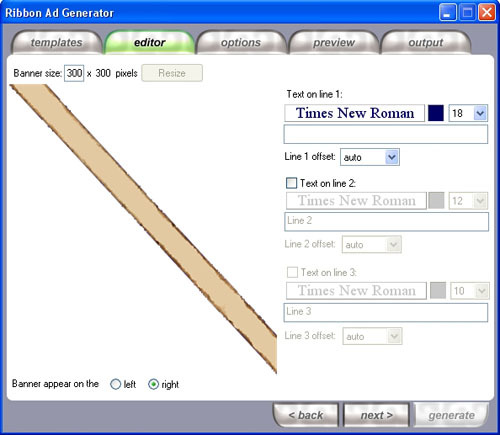 I want to order the "Ribbon Ad Generator" software for only $17. I understand that when I order I will receive an 'Instant Upgrade' to Master Resale Rights. I've already been told by a few who have tested the software that this should be priced at $97 or more. They're probably right, but to tell you the truth, I had this software designed almost a year ago, its been sitting on my computer doing nothing, only being used on my own sites. I just thought I'd get it out into the hands of other marketers so they could get the benefits of it too. And believe me, you will start to see the massive click-through rates these ads get as soon as you start using them, so click here to order now! P.S. Remember, there is absolutely no risk when your purchase "Ribbon Ad Generator" right now at this very low price. We can't guarantee this low price will be here tomorrow, and since every purchase is backed by our 100% money back guarantee, the time to take action is now.